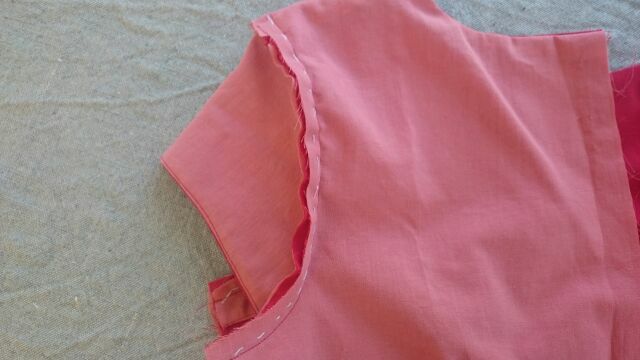 The photo below shows the sleeve inserted between the front and side front panel and has the side back panel attached. 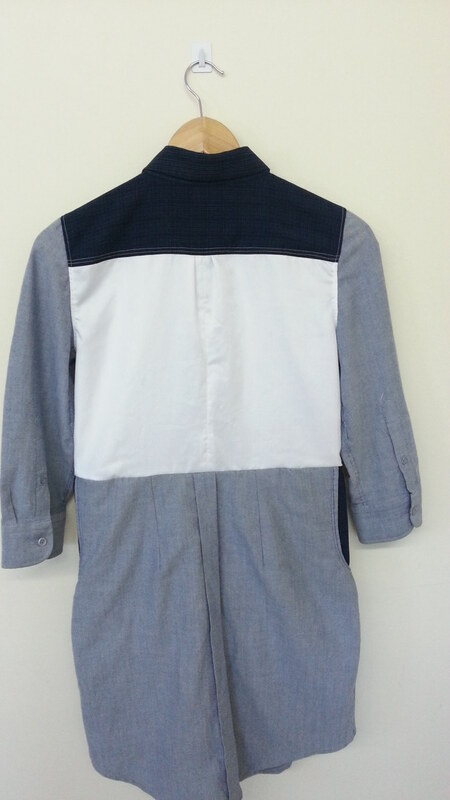 I realised at this point that it might be easier to line the side panels before attaching the sleeves. Just for the sake of having less fabric pieces to wrangle with at the machine. I mentioned in my last post that the sleeve pleats looked bulky, so I removed the sleeve and trimmed the pleats from the inside. I also stitched the centre back seam on the main fabric and had cut the back lining on a fold with an added pleat at the back neck. I joined the sleeve at the back by sandwiching it between the back panel and side panel. 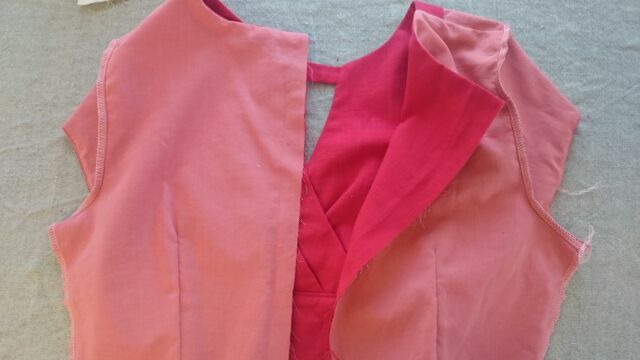 First laying out the back (right side up), then the sleeve (right side down), then the side panels (right side down). 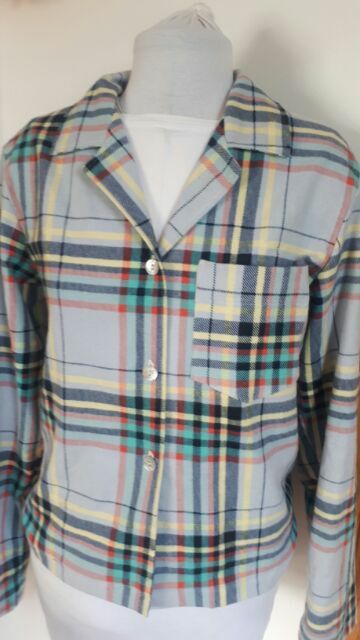 Notice how the side back panel does not reach up to the back neckline – there is a notch on the back panel for lining this up. The reason being I wanted the fabric and lining to hang free from each other below this point for comfort and for ease of hemming later. 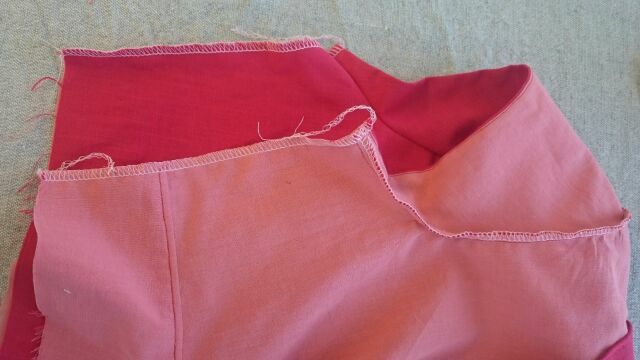 You can see in the photo below that I kept the lining and fabric separate when sewing the rest of the seam. I repeated this process with the other side, except I didn’t catch the back lining piece until later as it would have been too awkward. Here it is inside-out on my dressform. I closed the lining seam after this photo. I pinned from the right side and the reached inside to pull through the top part to machine sew . Phew….nearly there … I love this type of jigsaw puzzle! Hi there 🙂 Sewing for myself has taken a backseat lately… We’ve been lucky with the weather here the last few weeks. Irish summers are always unpredictable, so if the sun comes out then I rush to the beach. Blogging has taken an even bigger back seat! 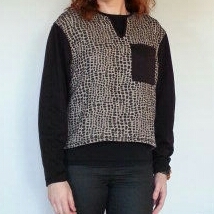 The sewalong instructions show the back neckline finished with bias tape. I used my lining pieces instead. I caught the shoulder seams between the bodice back and the bodice back lining – and stitched across the neckline and shoulder in one go….. I then tacked the bodice lining to the back bodice and treated it as a single piece from there on. Then pressing seams towards lining and understitching. 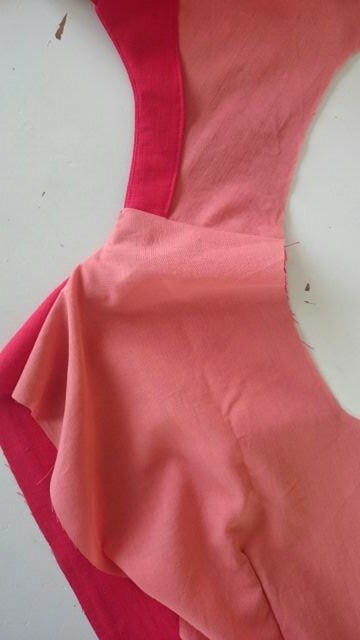 I pinned in the zip and the sleeve and side seams were then pinned to the bodice to check the fit. 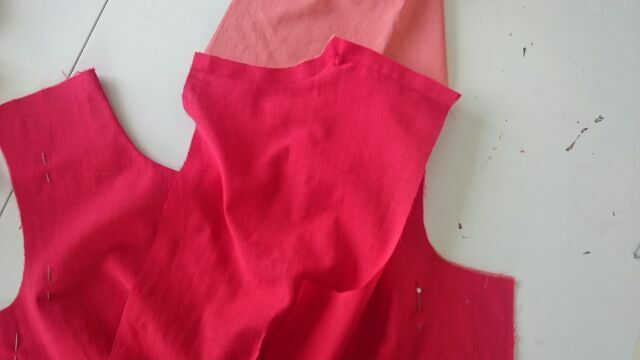 After that it was a matter of seaming the skirt and skirt lining, before attaching to the bodice, photos of which I’ll share soon :-)…. depending on the weather! I cut a size 34 ( I’m closer to a 36 with burdastyle but didn’t want it to be too big). It fits well, its cosy, and I’ve been wearing it all day…but… I’m not overly keen on the way the drop shoulders look. These are the most flattering of the pictures to be honest. When I see this in the mirror I want to change the shoulders. So, we’ll see – it might get reworked. 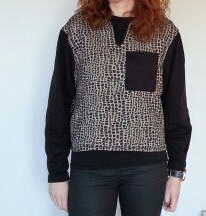 Because I really like the loose boxy style. Not scratching my head here...! 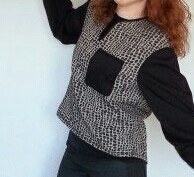 I loved the pleats at the front and the large pockets. I was pleasantly surprised to see that it’s a wrap skirt!